Posted on July 18, 2011 9:03 AM by Lana N.
It was a near record 95 degrees in Des Moines on Saturday afternoon, but hundreds of Iowans showed up in the capital to protest Gov. Terry Branstad's agenda of deregulation and reducing taxes on corporations and the wealthy while simultaneously cutting services for everyone else. The protestors blocked Grand Avenue for a rally, then marched up the hill after the rally up to the Governor's Mansion.Many of the attendees were members of labor groups like the AFL-CIO and Iowa State Education Association and did not mince words about which side they stood on. "The choice is really pretty clear for the governor -- (he) can stand up for the children and provide services and schools for the 20 percent of Iowa's children living in poverty, or he can continue to stand with the large corporations and factory farmers. I know (local) teachers are going to continue to stand for our kids. Gov. Branstad, it's time to put our kids first," Andrew Rasmussen, of the Des Moines Education Association, said. When the marchers reached the Governor's Mansion, they were told that Gov. Branstad was at a governors conference in Salt Lake City. They passed a letter with 400 signatures to an Iowa State Patrol officer listing their demands: a more just and democratic Iowa, an economy that works for everybody and public policy that puts communities before corporations and people before profits, politics and polluters.The connection with Wisconsin was clear in the minds of many protestors. Williams, a retired postal worker and union member said she braved all types of weather — rain, heat, wind and ice — to unload the mail trucks and today is no different. She even ignored the icy, chilly conditions last winter when she marched for bargaining rights during the demonstrations in Wisconsin. Big protests against austerity agenda... in Utah! Posted on July 15, 2011 2:02 PM by Lana N.
Over the past year, we've seen that no place in the country is safe from an elite agenda that seeks to "balance" budgets by throwing teachers, firefighters and police under the bus at the same time as they pass tax cuts for the wealthiest. But just as important, we've seen ordinary people organize everywhere to fight back in places nobody would expect... including Ogden, Utah. [caption id="" align="aligncenter" width="500" caption="Teachers and allies rally in Ogden's Liberty Park. "] [/caption]The Ogden Board of Education spent the last year trying to sharply cut teacher pay and benefits, but the Ogden Education Association blocked them at the negotiating table. Instead of continuing the negotiations in good faith, the Board of Education unilaterally sent each teacher a contract, demanding that each teacher sign their own individual contract by Wednesday or lose their jobs. In other words, the Ogden Board is trying to end collective bargaining in the district by fiat.Instead of quietly acceding to the Board's demands, Ogden teachers rallied together and reached out to allies in the community, gathering around one thousand supporters yesterday at Ogden's Liberty Park, including students, fellow union members, and people who remembered the great teachers they had growing up.Frustrated by an anti-teacher attitude by the Ogden Board, some teachers are already heading to jobs in neighboring districts where they feel respected. But it wasn’t enough to keep math teacher Rachel Lee at Mount Ogden Junior High. In May, as contract negotiations unraveled, she applied for and got a job in neighboring Weber School District. She wanted to be able to pay her bills, she said, and was frustrated by the turmoil between the OEA and district leaders. "I feel like we’re disposable to them. They don’t care about collaborating," she said in an interview at Thursday’s rally. "I hope they can understand what they’re doing to teachers is not good for students." And students showed up for their teachers at Thursday's rally as well. Fourteen-year-old Kyle Speckman worries he could lose some of his favorite teachers at Highland Junior High because of the contract dispute. He wore red to Thursday’s protest to show solidarity with teachers, and raised a hand-written sign that read, "Listen to my teachers, respect my teachers, so they will still be there for me." Posted on July 14, 2011 9:13 AM by Lana N.
Furious at a budget deadlock that has brought the state government to a standstill for a record two weeks and forced thousands of layoffs, Minnesotans took the streets yesterday, occupying a downtown Duluth intersection and garnering cheers and honks from sympathetic drivers.Earlier this week, Republican lawmakers heard from Minnesotans at a St. Cloud high school special education discussion that Gov. Mark Dayton also attended. "Where is your conscience," Anthony Akubue, a St. Cloud State University environmental and technological studies professor, told the lawmakers. "It's not about you, it is about us who sent you there," said Akubue, who said empty speeches or rhetoric did not sit well with him. "It's not about you. We sent you there." Gov. Dayton has proposed an increase in taxes for the state's millionaires to help cover the state budget deficit, but Republicans, who control both houses of Minnesota's state legislature, refuse to consider any proposals that raises taxes in any way, even if they only affect the wealthiest of the wealthiest. Dayton has also continued to make proposals in the last week to bring Republicans to the table, which they all refused.In something of a preview of what could happen if the federal government shuts down in August, the ongoing Minnesota shutdown has forced the state to cut back all but the most essential services, lay off 22,000 state workers, and halt construction projects, all of which will cause an economic drag on the state economy as long as it remains shuttered. The shutdown also affects thousands of non-profits statewide, many of whom have to cut jobs as a portion of their funding decreases. State parks, zoos, and historical sites are all shut, too. And even bars, groceries, and convenience stores are affected, because state licensing offices are shut, keeping brands like Miller and Coors from renewing their distribution license and forcing them to pull their beer from the shelves and from bars. Posted on July 13, 2011 3:59 PM by Lana N.
Posted on July 13, 2011 8:44 AM by Lana N.
On the date of the Wisconsin recall primary elections, where six Democratic candidates easily won over their Walker-supporting fake Democratic rivals, Gov. Scott Walker gave a speech at Gateway Technical College during their centennial celebration.But Walker met with an angry response from the assembled students, teachers, and graduates of the college. Over half the attendees jeered at Walker, drowning out his speech. Others turned their backs or simply walked away as he spoke.It took a considerable amount of gall for Walker to give a speech commemorating the one hundred year anniversary of the oldest technical college in the country. Walker's budget slashed state funding for technical schools all around the state, and he pushed through radical measures to cut the legs out from teachers and instructors. "It's insulting to all of the students, staff and businesses who depend on technical colleges to have someone who just slashed our funding by 30 percent," said Michael Rosen, a state board member with the Wisconsin Technical College System. "He can't be seriously attending this celebration," he said. Posted on July 13, 2011 8:16 AM by Lana N.
[caption id="attachment_286" align="alignright" width="205" caption="Protestors occupy Gov. Brian Schweitzer's office and reception room."] [/caption]Just a couple months removed from the largest protests in Montana history (over 1,000 supporters of labor rights surrounding the state capitol), approximately 100 activists occupied offices in the state capitol to protest Gov. Brian Schweitzer's support for a proposed pipeline project.Just to put this into context, an existing pipeline ruptured earlier this month, spilling about 1,000 barrels of oil into the Yellowstone River during flood stage, causing millions of dollars in damages and forcing over 100 people to evacuate.Protestors were spurred into action by Gov. Schweitzer's pronounced support for clean energy and healthy communities on the one hand and his proposals to help increase oil extraction in the region, including the proposed Keystone XL pipeline.“As the recent Exxon Mobil pipeline disaster has made clear, Governor Schweitzer is attempting to turn Montana into an extraction state, while at the same time publicly proclaiming his supposed support for clean energy, protecting the environment and building healthy communities. It’s one or the other. You can’t be clean and dirty at the same time,” according to Bozeman’s Erica Dossa, who also took part in the action. 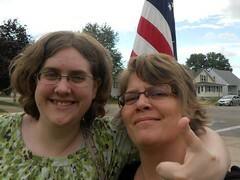 Posted on July 12, 2011 11:01 AM by Lana N.
Primary elections are in full swing today in Wisconsin for the nine recall elections. Nine Wisconsin senators face a recall election in August, six Republicans and three Democrats. Through the efforts of labor unions, the Republican senators are facing recall for supporting Gov. Scott Walker's draconian budget that slashed public services and attacked public employee labor rights, something neither they nor Scott Walker mentioned during the fall campaign. Republicans engineered recalls against the Democratic senators for standing up to Walker by blocking quorum on his budget when they left the state.Today's elections are primary elections to select the candidate who will face the recalled senator in the general recall election in August. Normally, a recall primary is a humdrum affair, if there's even a more than one candidate in the primary. But Wisconsin Republicans are going all out by installing and supporting Republican candidates in the Democratic primary recall elections. You see, in Wisconsin, primaries are open to voters of both parties, so a Republican can take a Democratic ballot on primary election day and vote for a fake Democrat, as long as the fake Democrat is on that Democratic ballot. Even if the fake Democrat is a longtime Republican, like John Buckstaff, the 81 year old Republican who is running in the Democratic recall primary to win the right to face off against Republican Randy Hopper in August. In the last cycle, Buckstaff gave $575 to Hopper, and today Buckstaff is asking voters to vote for him to represent the Democratic Party against Hopper whenever the recall election takes place in August. If you live in Wisconsin in one of these districts, make sure you get out to vote today. Every vote counts! Posted on July 11, 2011 6:58 PM by Lana N.
Posted on July 11, 2011 5:32 PM by Lana N.
Not the Way Forward: Jumaane Williams from New York Communities for Change on Vimeo. NY Communities for Change has an interesting campaign to get JP Morgan Chase to change their behavior on loan modifications. Rather than push at the federal level, where banks' cash and influence often stymie reformers, or at the micro-level, which works only one family at a time, NY Communities for Change has brought several New York cities and townships on board with the Not the Way Forward Campaign, where municipalities refuse to do business with JP Morgan Chase until it reforms its foreclosure process.The campaign started in February, when New York City Council Member closed his bank account at Chase (as seen in the video) in protest of Chase's refusal to work with homeowners on loan modifications despite receiving billions of dollars in government bailouts. Now it has spread to the Village of Hempstead and the Village of Freeport, who both closed their accounts with Chase. The Cities of Albany, Binghamton, Rochester, and Yonkers; along with Albany, Ulster, and Monroe Counties are all looking at closing their Chase accounts and refusing to bond with JP Morgan Chase.Scratch that - Albany County has now announced that they will no longer bond with JP Morgan Chase, and the Albany City Council has voted to recommend to their City Treasurer that they no longer do city business with Chase, which the treasurer has promised to abide by.The problem isn't abstract. Maribel Toure is an X-ray technician who got hit by a taxi on the way to work. She lost out on four months pay while she recovered, and because her husband just lost his job in the ongoing economic slump, they fell behind on their mortgage payments. Chase refused to give her family a straight answer on loan modification before they served her up with a foreclosure. Funny enough, they agreed to a loan modification after the Village of Hempstead, Toure's home town, dropped Chase's business. Posted on July 11, 2011 8:19 AM by Lana N.
Some day, when you're working extra hours trying to somehow get ahead of the game, you might stop and think to yourself, "Hey! My parents could somehow afford to own a decent home, take vacations, and not stay up nights wondering how they were going to pay for my college. And if there was a family medical emergency, their first thought wasn't going to be 'How can I pay for this?'" And when those memories surface, you wonder, "Where did it all go? What happened? Is it just me?" Of course it isn't just you! A whole generation of Americans faces exactly the same problems, exploding health care costs, rising cost of higher education, fewer jobs, stagnant wages, and fewer benefits. This short video will help explain how this state of affairs came to be, and what you can do to reverse it.